My article published November 12, 2012 in Smartertravel.com covering my trip to Kiev in July 2012. High Points: Picturesque old Kiev is set in the hills, overlooking a river with many parks. The Old Town has numerous cathedrals worth visiting and can easily be covered in one to two days. A good circuit is to begin at Independence Square and walk up the hill to St. Alexander’s Church. Note the different facades on the houses along the way. From the church, turn left and walk along the park to St. Michael’s golden-domed cathedral. Then, cross the square and continue on to St. Andrew’s Cathedral and the beginning of Andriyivsky descent, a winding cobblestone street lined with colorful local vendors. 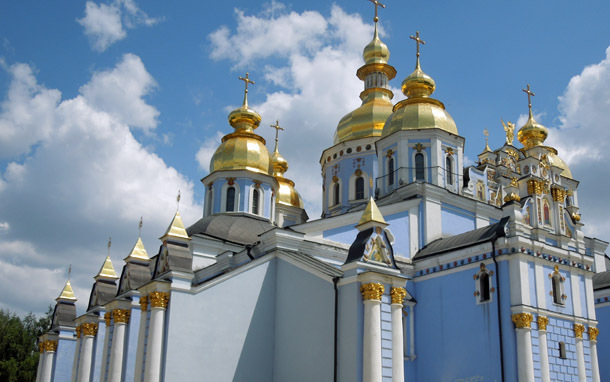 Kiev has two UNESCO sites, which should not be missed. Both date back over 1000 years. Sofiyivsky Cathedral in Old Town is worth the visit for it’s original murals. Be sure and note the Madonna’s eyes as they follow you from the first to second floor. Take the metro to Pechersk Lavra Monastery, the other UNESCO site. The grounds of this monastery are extensive, so allow at least four hours for your visit to cover everything. On the weekends, Khreshchatyk, the main thoroughfare, is closed to traffic and the six lanes become a pedestrian walkway filled with musicians. In the summer, it’s light until 10 p.m., so there’s ample time to stroll, explore the side streets, and enjoy the numerous cafes. Low Points: While the catacombs and mummified saints are the main attraction of the Lavra Monastery, we found them disappointing. Thousands of visitors wait in line to make the pilgrimage, but hot and stuffy quarters with what look like newly plastered walls was not particularly impressive. Savings Strategy: Restaurants along Khreshchatyk tend to be overpriced. There is inexpensive bus transportation from the airport to the railway station in the city proper. The information desk at the airport that can direct you to the bus stop. To get to Old Town from the railway station you will need to negotiate a taxi or take the metro. There are three rail lines, stops are numerically labeled, and signage in English makes it easy to use. At 2 UAH (about $0.25 US currency; see XE.com for current exchange rates) per trip, it’s a bargain. Where I Stayed: I used TripAdvisor to locate a hotel that was centrally located. The Ukraine Hotel, included a full breakfast, was right above Independence Square, and close to two metro stops. For the budget-minded, there are hostels located in the Old Town. If You Go: Definitely take the free walking tours which are offered daily at noon and 4 p.m. from Independence Square. The tour at noon covers the Old Town and the afternoon tour explores the numerous parks. Consider a side trip to Chernobyl for an up-close view of Reactor Number 4, which exploded on April 26, 1986. A trip to Chernobyl must be organized by an approved tour operator 10 days prior to your visit. It is relatively expensive (approximately $150 US dollars) and will take the entire day, but is a fascinating experience to visit the area where no one will ever be able to live.